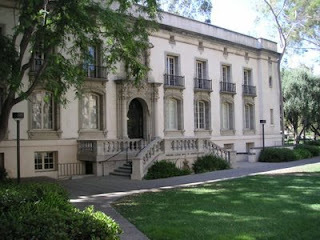 The California Institute of Technology (commonly referred to as Caltech) is a private, coeducational research university located in Pasadena, California, in the United States. Caltech maintains a strong emphasis on the natural sciences and engineering. Caltech also operates and manages the National Aeronautics and Space Administration (NASA)'s Jet Propulsion Laboratory (JPL), an autonomous-space-flight complex that oversees the design and operation of most of NASA's space-probes. Caltech is a small school, with only about 2100 students, but is ranked in the top 10 universities worldwide by metrics such as citation index, Nobel Prizes, and general university rankings. Caltech began as a vocational school founded in Pasadena in 1891 by local businessman and politician Amos G. Throop. The school was known successively as Throop University, Throop Polytechnic Institute, and Throop College of Technology, before acquiring its current name in 1921. Caltech and the Polytechnic School, a private, college-preparatory academy across the street, were part of the same institution until 1907. Astronomer George Ellery Hale played an important role in Caltech's early development, helping to mold the school into a major scientific institution. Hale joined Throop's board of trustees after coming to Pasadena in 1907 as the first director of the Mount Wilson Observatory. At a time when scientific research in the United States was still in its infancy, Hale saw an opportunity to create in Pasadena an institution for serious research and education in engineering and the natural sciences. Hale succeeded in attracting private gifts of land and money that were used to build well-equipped, modern laboratory facilities. He then convinced two of the leading American scientists of the time, physical chemist Arthur Amos Noyes and experimental physicist Robert Andrews Millikan, to join Caltech's faculty and assist in establishing the college as a center for science and technology. In 1917 Hale hired architect Bertram Goodhue to produce a master plan for the 22-acre (89,000 m²) campus. Goodhue conceived the overall layout of the campus and designed the physics building, Dabney Hall, and several other structures, in which he sought to be consistent with the local climate, the character of the school, and Hale's educational philosophy. Goodhue's designs for Caltech were also influenced by the traditional Spanish mission architecture of Southern California. 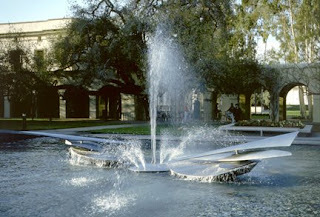 Caltech remains, to this day, a small and highly focused university, with approximately 900 undergraduates, 1300 graduate students, and over 1000 faculty members (including 293 professors, 104 emeritus professors, 66 permanent research faculty, 87 visiting faculty, and over 500 postdoctoral scholars). A private institution, Caltech is governed by its Board of Trustees. As of 2006, Caltech has 31 Nobel laureates to its name. This figure includes 17 alumni, 14 non-alumni professors, and 4 professors who were also alumni (Carl D. Anderson, Linus Pauling, William A. Fowler, and Edward B. Lewis). The number of awards is 32, because Pauling received prizes in both Chemistry and Peace. With fewer than 25,000 alumni in total, nearly one in a thousand have received the Nobel Prize — a ratio unmatched by any other university. Five faculty and alumni have received a Crafoord Prize from the Royal Swedish Academy of Sciences, while 47 have been awarded the U.S. National Medal of Science, and 10 have received the National Medal of Technology.Other distinguished researchers have been affiliated with Caltech as postdoctoral scholars (e.g., Barbara McClintock, James D. Watson, and Sheldon Glashow) or visiting professors (e.g., Albert Einstein and Edward Witten). 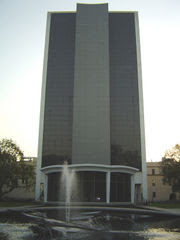 The Spitzer Science Center (SSC), located on the Caltech campus, is the data analysis and community support center for NASA's Spitzer Space Telescope. The SSC, part of the Infrared Processing and Analysis Center (IPAC), works in collaboration with the Jet Propulsion Laboratory.